Upslope winds picked up considerably in unprotected zone above 9000 ft. Winds coming out of the SSW. Sun and significantly warmer temperatures helped contribute to this. Stronger as the afternoon wore on. Moderate snow transport and a good amount of eroded snow from wind were visible (photos below are not the best but show this.) Observed a bit of swirling wind as I got above 9300 ft and it was difficult to pinpoint which direction the wind was primarily coming out of. This was most noticeable on the PC Ridgeline. Very small possibility for significant cross loading. 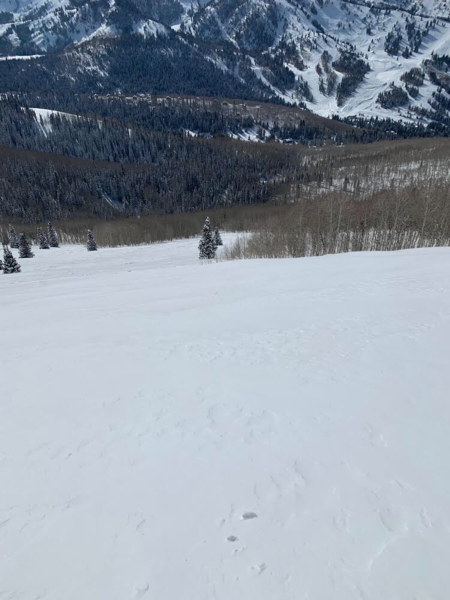 From observations made over the past week or so it appears many avalanches have been failing on facets and surface hoar that developed before this last big storm. With the high amount of water present in the most recent storm this is no surprise. Something to watch out for going forward. Did not observe any undocumented avalanches while I was out. 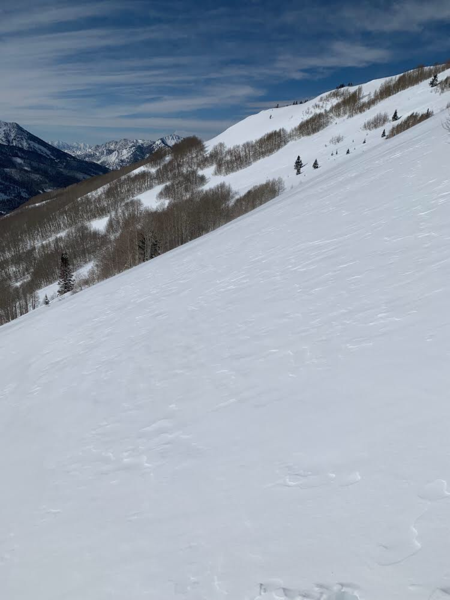 Clear skies and windy above 9000 feet out in the open in USA Bowl and along PC Ridgeline. Skiing was pretty slow and wind affected but still enjoyable. The increasing temperatures and upslope winds could cause some wind loading and cornice concerns through the weekend on leeward slopes. South faces should stabilize if winds out of the South continue.